Evenflo is an award-winning manufacturer of strollers, high chairs, car seats, travel systems, carriages, accessories etc. 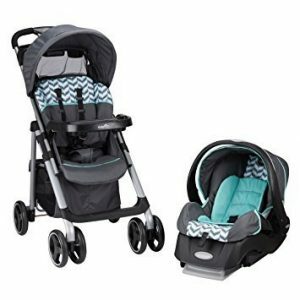 Their line-up includes full sized jogging strollers, urban strollers, double strollers, lightweight strollers and a lot more. Let’s take a closer look at some of their best offerings. Here’s our list of the 12 best Evenflo strollers in the USA. 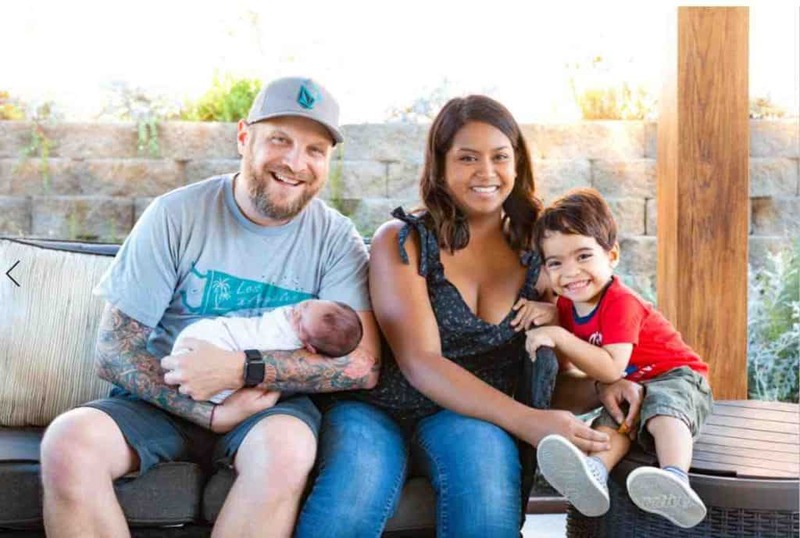 The Flipside is a full size, feature loaded travel system stroller consisting of a four-wheel stroller, the Litemax infant car seat and car seat base. The stroller has a maximum carrying capacity of 50 pounds while the car seat can hold a baby weighing between 4 to 35 pounds. The car seat clicks securely onto the stroller frame. This stroller and Litemax 4-35 infant car seat combo offers three modes of operation: parent facing, forward facing and travel system (car seat on stroller frame). The Litemax is the first car seat to be roll-over tested. Car seat base included. • One of the lightest travel systems in the country. Stroller plus car seat weight is only 25 pounds! Very stylish travel system includes stroller, Embrace infant car seat and car seat base. Stroller has a max carrying capacity of 50 pounds and car seat can hold a baby weighing between 4 and 35 pounds. • Stroller has an extra storage pocket at the back. Parent tray included. Big basket underneath the seat. • Predominantly an urban stroller. Not very suitable on rough country roads. This travel system is usable from birth all the way up to 5 years! Moreover, the stroller accommodates not just one, but two kids – comes with a removable board that an older child can use for riding along. Set-up includes stroller, Litemax 4-35 infant car seat and base. • The rear-facing Litemax is the first car sea to be roll-over tested. It’s also tested for side impact. • Multi-position recline, adjustable footrest, infant head pillow, full coverage canopy with peek-a-boo window, parent cup holder included. This is a tried and tested stroller with multiple rave reviews. 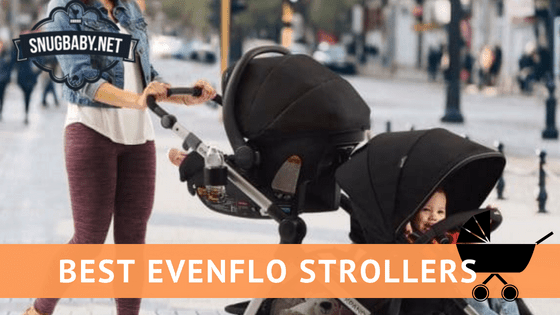 Evenflo calls is a ‘grab-and-go’ stroller and it’s been designed for families that like to stay active. • Quick compact and easy seat-lift folding mechanism – stroller folds into a cube size. Very convenient! This is a best-selling travel system with not 2 or 3 but 6 modes of operation! Includes stroller, SafeMax infant car seat and base. Car seat and base are manufactured using premium materials. An anti-rebound bar dissipates the energy of impact and keeps baby safe. The Folio is yet another highly rated travel system by Evenflo. It is made up of the roll-over tested LiteMax infant car seat, stay in car base and the stroller frame with seat. Infant car seat is recommended for babies weighing between 4 and 35 pounds while the stroller has a maximum carrying capacity of 50 pounds. Not often do you see the words affordable double stroller together. However, that’s exactly the case with the Minno Twin. Not only is this double stroller economical, but it’s also rather practical. • Two seats in side-by-side (tandem) configuration. • Each seat can hold a kid weighing 45 pounds or less. Total weight is 90 pounds. • Despite being a double, the width is just 27 inches. Stroller passes through most standard doorways. • Compact, one-handed, self-standing fold. • Independent Multi-position recline and two position footrest. One baby can nap while the other looks out. This 3 wheeled jogging stroller is JPMA tested and weighs about 10% lower than the competition. It’s perfect for running errands or strolling in the city and also for jogging. The Victory is suitable for a child weighing up to 50 pounds. Can be upgraded into a travel system if desired. • Easy to fold. Stands independently when folded. Ultra slim 17 inch fold. Not bad for a jogging stroller as they tend to be very bulky. • Lots of storage space, child tray with dual cup holders and two deep parent cup holders for water bottles, cans etc. The Minno Lightweight Stroll,weighs just 17 lbs and accommodates a kid weighing up to 45 pounds. It’s not a bare bones umbrella stroller, but a full fledged lightweight stroller and offers convenient features for both parents and kids. • Does not accept car seats. Cannot be converted into a travel system. This travel system is equipped with Evenflo’s Life Saving Sensor Safe technology. It is the winner of numerous awards, including the JPMA Innovation Award, Pregnancy and Newborn Magazine – Top Gear Award and so on. • A chime sounds if the buckle becomes unfastened while the car is in motion. • Upon reaching the destination, the system reminds the parent that their child is buckled up in the car. • These little things are so simple and yet, so sensible. They truly save lives. • Stylish, unisex look. Black color looks cool! • Nothing much to dislike about this product. However, stroller is not usable for jogging. This travel system stroller Includes the Vive stroller (weight rating 50 lbs) and Embrace infant car seat with base (extended weight rating 4 to 35 lbs). • Large canopy with Sun visor, XL storage basket, parent organizer tray with two cup holders and a compartment for cell-phone. • Rear facing car seat enables child to have eye contact with parent. As you may have noticed, Evenflo strollers score high on customer satisfaction while still retaining a sensible price tag. Did you enjoy learning about the 12 best Evenflo strollers in the country?